1. Duplication - by putting their work into different places, different maps, we're duplicating effort and not benefiting from each other's work. For example, it's common to find several different people all trying to map food growing spaces in the same part of town. Why not share? 2. Tools - not everybody has the tools to map these things, to put the results onto their web site or provide it to their council in the correct format. 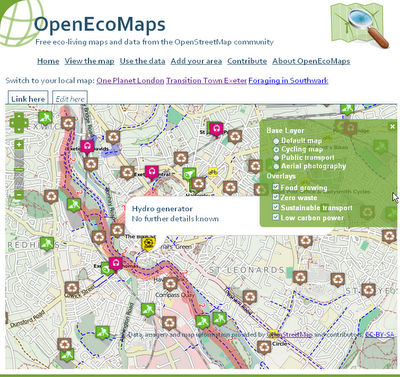 OpenEcoMaps encourages people to share all their data in the same place - OpenStreetMap - and makes it easier for you to make use of the results. OpenEcoMaps takes the data from OpenStreetMap (published under the Creative Commons Attribution-Sharealike 2.0 license), a community that is mapping the whole world and providing all of the information as open data. It takes a fresh data extract every hour and turns it into reusable KML Files, which can easily be displayed on a map.